December 1, 2011 Did the American Recovery and Reinvestment Act Work? 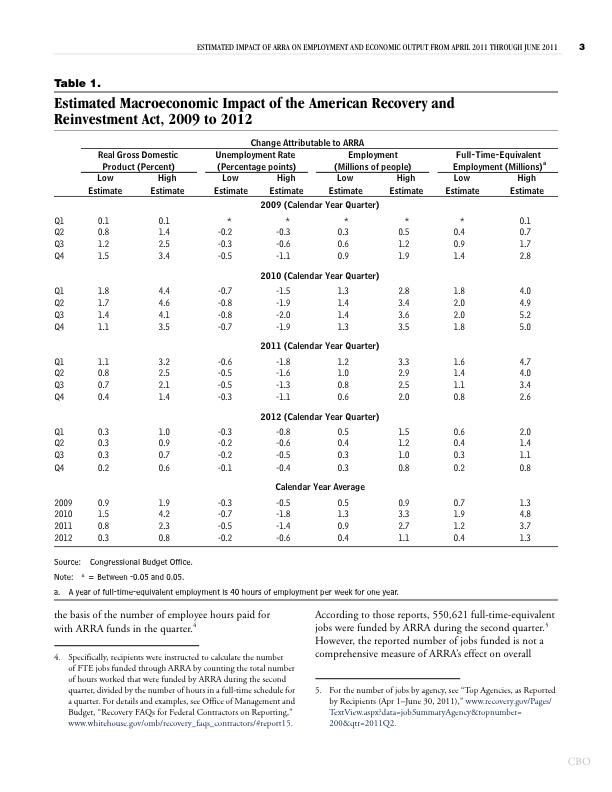 Estimates from CBO economist using several different economic models show that, contrary to some opinions by radio and talk show hosts, the economic impacts of the American Recovery and Reinvestment Act of 2009 & 2012 (ARRA) were more positive than is currently believed by most of the American public. Real GDP increased between 1% and 4% during the second and third years of the bill’s impact, 2010 and 2011. The unemployment rate would be -0.5% to 2% higher without the federal dollars passing through the economy. ARRA impacted employment favorably too by increasing it 1% to 2% in 2010 and 2011.